At the heart of the current scandal and many privacy scares in the past is the permissions we give to apps that want to access Facebook on our behalf. Ever logged in to a website using your Facebook account or played one of the thousands of online games that require a Facebook login? You probably gave those apps permission to see your profile and gather information about you. 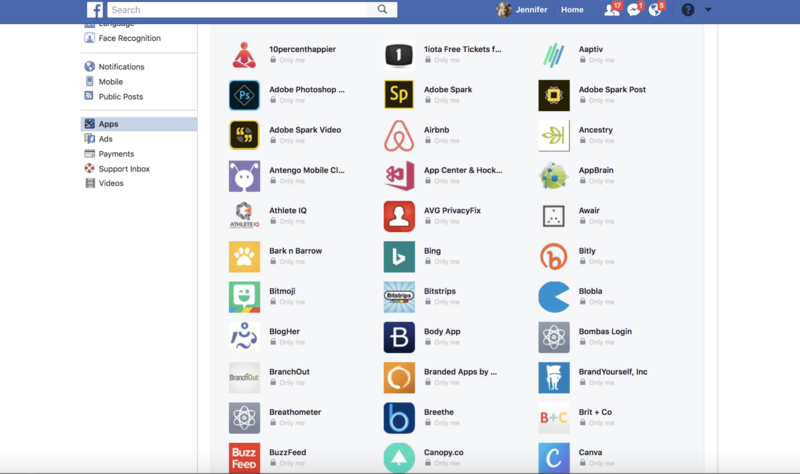 To see who is snooping your information, head to your Settings page on Facebook’s website and then click Apps on the left-hand side of the page. At the top, you’ll see a list of all the apps you’ve permitted, and you might be shocked by how many there are. When I checked this out, I realized there were 298 apps with access to my Facebook information. 298!!! Unfortunately, you can’t remove them all at once, but you can click the little “X” next to each app and remove its access. This will force it to ask for permission to see your profile if you ever use it again, and if not then good riddance! It’s not just your apps that can access your information; Facebook makes it all too easy for your friends to share your information with apps as well. “People who can see your info can bring it with them when they use apps” according to Facebook, and given the way privacy has been eroding lately, that’s not something I’m willing to accept. On that same Apps page in the Settings menu, click “Edit” under the heading “Apps Others Use.” Here you can customize how much of your information you want your friends to be able to share. You can choose as much or as little as you want, but some apparent no-nos are your birthday, app activity, location, and things you post on your timeline. Personally, I just unchecked it all. Companies being able to see your information is only one piece of the privacy puzzle. The other, equally important factor is Facebook allowing companies to serve you custom ads based on what they know about you. You can directly control exactly what companies are allowed to show you, and all you have to do is spend a few minutes tweaking your settings. Under the Settings page click on “Ads” on the left-hand side of the screen. Here you’ll see a list of the different ad-related settings you can change. Under “Ad Settings” you can select “No” or “Off” on each of the options to prevent customized advertising. Under the “Your Interests” and “Your Information” tabs you can see what pieces of private data you’re giving to advertisers. You’ll see that info like your employer, relationship status, education, and job title are all on by default, so toggle them off to keep your details away from prying corporate eyes. Click the “Your Categories” option to see how Facebook classifies you based on your political leanings, how often you use the site, what apps you use, and what kind of smartphone and computer you own. You can remove all of these as well if the creepy factor is just too much for you.